India is famous for the Unity it has. Different states with vast culture great history and heritage still we stand united, strong as a nation. Our culture has a unique touch of bringing people, from all walks of lives, together. It’s like the Sunlight which has seven colors yet remains as a single entity. 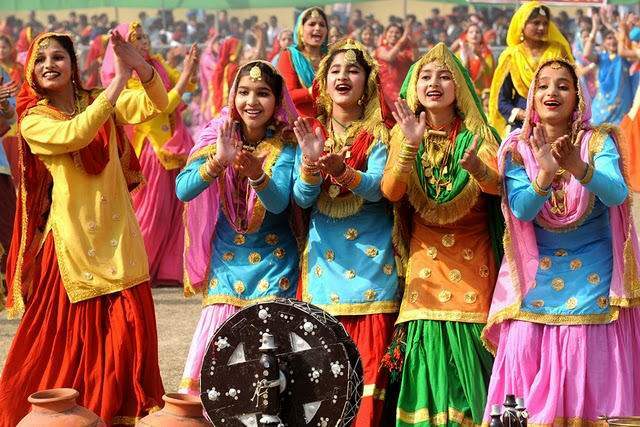 Talking or thinking of color immediately takes you to the northern Indian state – Punjab, the state full of bright colors, flamboyance, fun, vibrancy, energy, flavor, rhythm, and dance. 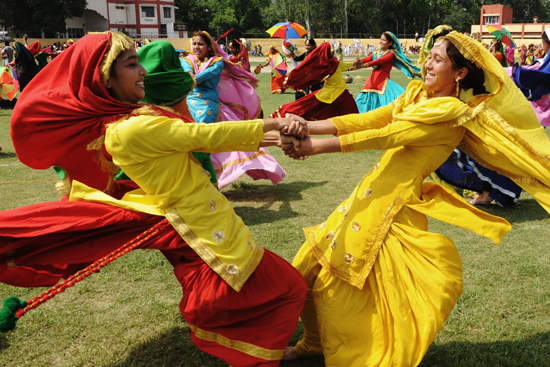 The folk dances of Punjab are so famous that they have become the mainstream or national dance of the country – “Bhangra” and “Giddha”. The dance form is the counterpart of the male version dance called “Bhangra”. 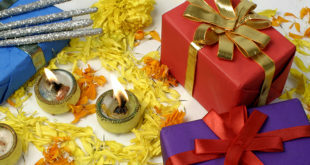 Though the historians say that it originated in the form of “Ring Dance”, today’s Giddha is much more colorful and is more energetic. 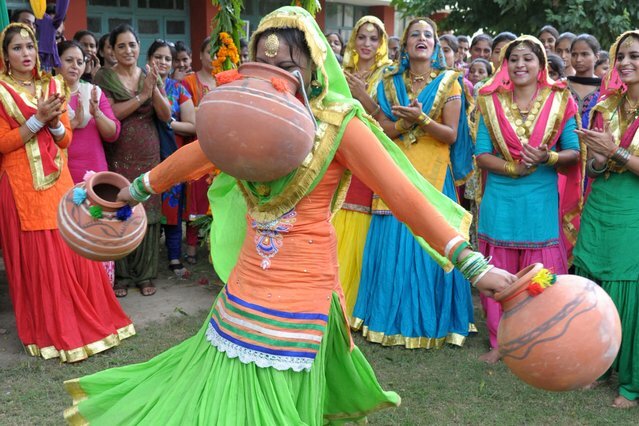 It is a “females only” dance and is performed in any occasion. Rather it would be better to state that it is so powerful and fun-filled that it itself creates an occasion. Females wear rich, colorful, embroidery “Salwaar” (loose and roomy pants) and “Kameez” (Shirts) with “Dupatta” (drape or Scarf). Nowadays in place of Salwaar Kameez ladies also wear “Lehenga” (long Skirts) and “Choli” (Blouse). Sometimes Salwaar is replaced with “Shararas”. 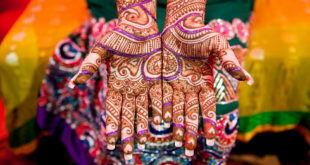 They also wear, ‘Pazabis’ (anklets), ‘Rani-Haar’ (a long gold necklace), ‘Bazu-Band’ (worn around upper arm), ‘Haar-Hamela’ (golden necklace with gems) and ‘Suggi-Phul’ (worn oh head). The feminine grace is presented in this dance form and is very visible with the kind of accessories they wear. The bangles, tika, jhumka, nath and the traditional handcrafted, colourful hanging they tie in their hairs called “Parandi”. In fact “Parandi” is most important accessory they will wear and showcase. Ladies form a big circle and perform the dance. One of the dancers sits in the center of the circle with a ‘Dholki’ (Drum). There is no other musical instrument which is used yet the songs sung by the ladies and the use of unique hand-claps with lyrics (words) called “Boli” makes it fun filled and catchy. The dance is vigorous in moves but has no particular style or pattern. While dancing one of the dancers moves into the circle and performs her steps and then goes back to her position and this is replicated by each and every dancer one by one. The essence of Giddha lies in the shaking, swinging, twisting of the body and shoulders. The dance steps are synchronized with the lyrics called “Boli”. These are normally enacted messages from folk poetry, relationships, husband and wife teasers, love affairs, the loneliness of a bride, social messages, and even political issues. The distinctive clapping, a mix of single, double, and triple clapping, keeps on going in the background non-stop and makes it the distinguishing factor. 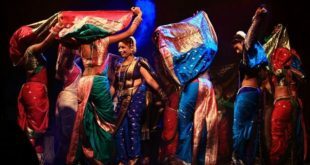 This folk dance has become so famous that “Bollywood” movies have been using them in their dance numbers since ages. It is not only famous in India but also has an international presence. There are many professionals who take classes and train you on this dance form. Some even believe that it can be used as therapy as the clapping can be co-related with acupressure.